What does your bar shelf say about your establishment or home bar? Does it say, “This place functions as a bar, but that’s it”? Wouldn’t you rather they say, “Come hither and gather around my bottles”? If your bar shelf displays your wares with no enthusiasm, can you expect much more from your patrons? Ordinary bar shelves, lit with obscure light fixtures, at least offer you handy access to your liquor supply. But when you mate internal LED lights with translucent acrylic platforms, your bottles suddenly come to life for all to see and admire. With a near-infinite range of color mixes from rows of energy-sipping LED’s , your patrons can’t help but see your bar in a whole new light. Fascinate them with a show of rotating colors, and they won’t want to leave. Since you need to light your bar somehow, you may as well save on your energy use while you’re at it. Of all the lighting technology out there, LED requires the least amount of electricity watt for watt. When you install lighted bar shelves, you gain soft illumination without switching on juice hogs like florescent or incandescent bulbs. If you have too little room for a large rack of lighted bar shelves, consider a lighted bar and lighted furniture, as well. When you outfit your bar in LED radiant shelves, working bar and cocktail tables, you save a chunk on your utility bill while charming your guests with attractive, subdued ambience. Adding LEDs to your bar shelf display is like a marriage made in heaven. Since you keep control of your rotating light and color options from a hand-held remote, your bar never becomes tired and boring. 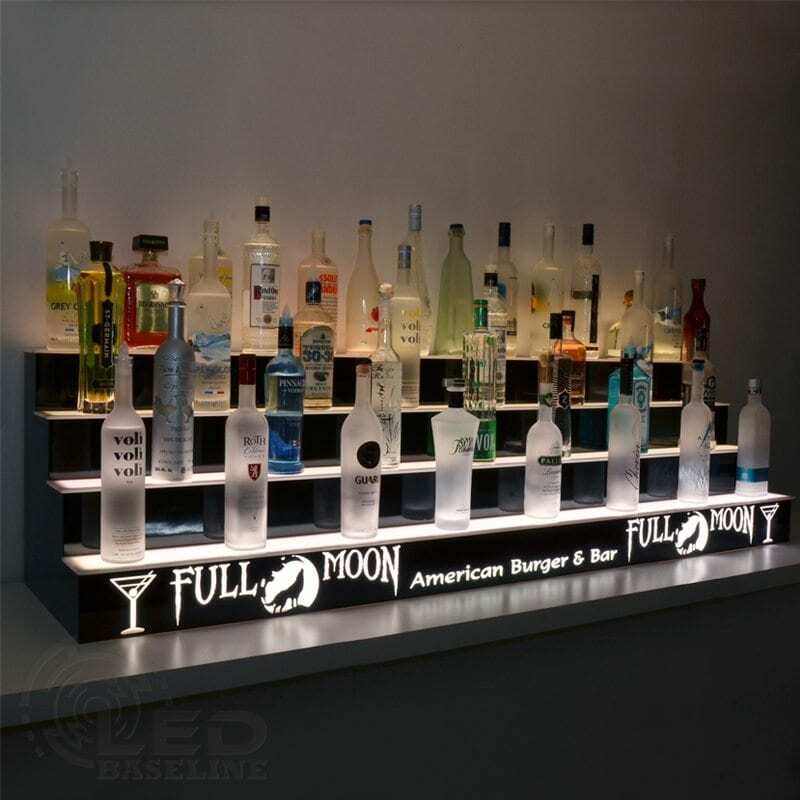 Also, since they can be custom designed and manufactured for any environment, lighted bar shelf displays will always enhance your establishment’s reputation. 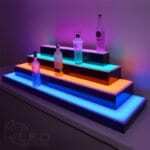 You know you want to incorporate at least one lighted LED liquor shelf into your bar. 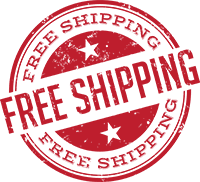 Are you limited to pre-fabricated shelves from online retailers? Maybe you would rather acquire a shelf — or many — custom designed for your unique bar. Well, if you want options, you’ve come to the right place. You choose exactly which features, finishes and dimensions that make your dream bar come true. 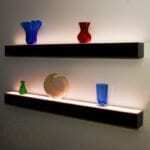 Here’s a sampling of options from which to build your perfect LED lighted shelves. Stands need no mounting. Simply place on the front or back bar and stock with your liquor bottles. Also known as island shelves, you can go simple with one tier or as complex as you like. Your stands can resemble bleachers or stage platforms with each successive tier smaller than the one below. Tiers grant your entire stock face time with your guests. No bottle, no matter how beautiful or lowly, gets left out of the display when you have enough tiers. Each row can have as much vertical reveal as you like with low, medium or high profile shelves. 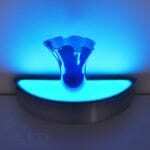 Of course, LED lights brighten every level according to your color preferences for each. Want to nestle your stock against the wall, freeing up bar space for mixological magic below? 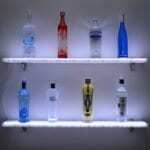 You can mount your LED liquor shelf with visible brackets or as floating shelves. Again, you choose your shelf dimensions to suit your tastes. While the lighting is what attracts all the attention, the shelf finishes follow close behind in importance. You can choose from colored laminates, real wood or wood laminates and sheet metals with a variety of visual and tactile surfaces. Have a different idea? By all means, it can be explored and most likely implemented, too. 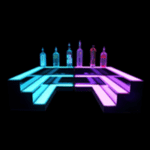 Few things are as classy as your logo lit from behind embedded in your LED liquor shelf. If not your business logo, then you can choose logos of your favorite sports teams or any artistic design that will make your bar more memorable. If you’re designing a new bar or planning to renovate an old one, you really should consider a lighted liquor shelf or whole display. 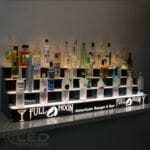 These shelves, lit from within by LED lights, will give your bar a modern, fascinating face lift. Heck, it might even become the focal point of your whole space. Here’s just three of the many things you’ll enjoy with lighted liquor displays. Whether it’s just one lighted stand on the front bar holding your specialty liqueurs, or several tiers of shelves on the back bar supporting your whole array, your patrons will notice and remark on how cool your shelves look. Do you want to remind them of your bar brand? 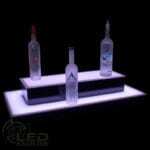 Have your logo lit from within on your liquor shelves for extra style. As your piéce de resistance, add a dynamic light show to the display with custom colors rotating according to a pattern you design . When your liquor shelves glow from within, you eliminate the need for harsher, more direct lighting around your bar. Your staff can whip up orders while your customers bask in the glow. 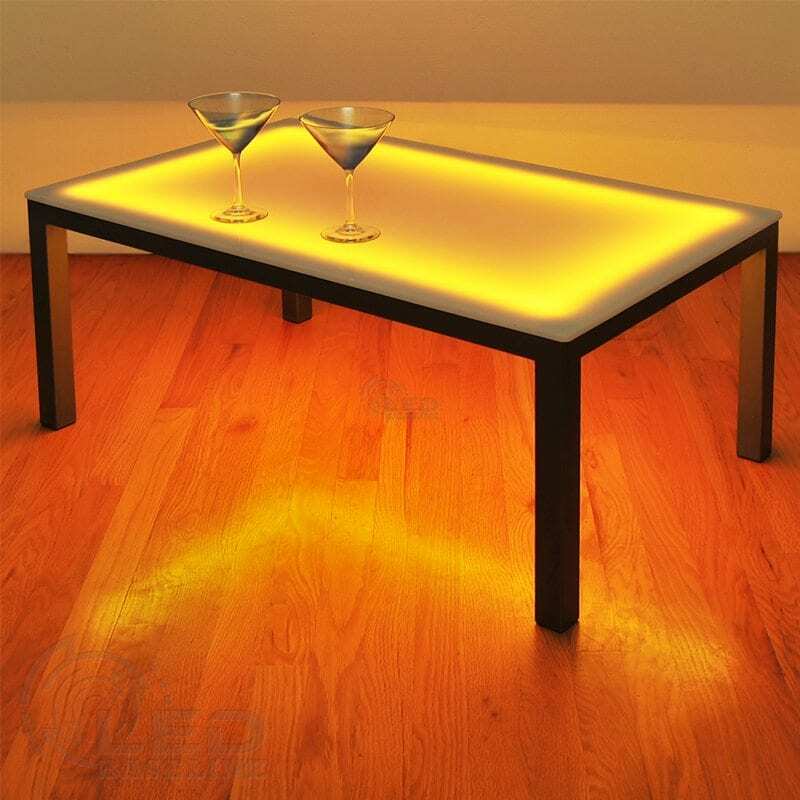 If you want your bar’s lighting to mesh nicely with the seating area, you can add LED lighted furniture, as well. 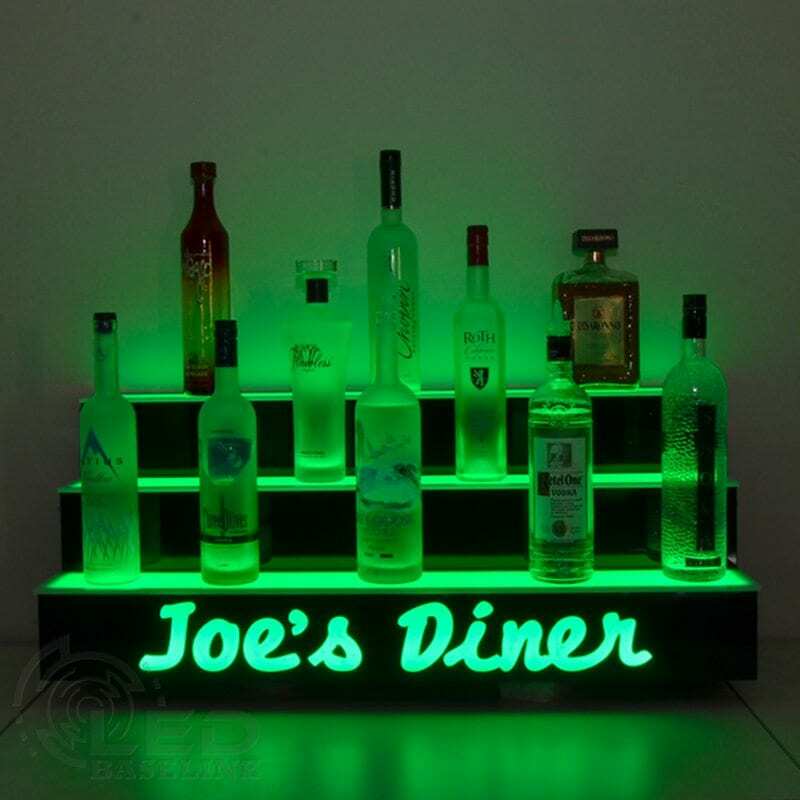 These custom-made pieces do for the rest of your establishment what the lighted liquor displays do for the bar: give it a magical ambience to impress your guests and inspire them to stay and spend more. Finally, illuminated liquor shelves serve the fundamental purpose of supporting your stock. You need shelves and stands anyway, right? Since these shelves are built to order, you can outfit your counter surfaces in any way that fits your space. From single-tiered shelves, to multi-tiered wrap-around stands, your bottles will have a snazzy place to live and work. 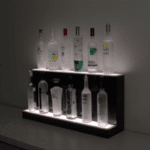 Explore what a lighted liquor shelf can do for your remodeled bar! We may never know the names of the designers and craftsmen who create unique and clever liquor bottles. But their handiwork deserves to be seen and appreciated at your bar. Whether it’s on your portable banquet bar or at your fixed business location, a worthy liquor display affords your patrons a delightful exhibit of bottle art. With all the enchanting shapes, colors and textures, the longer you keep your patrons’ attention at the bar, the better your opportunity to increase sales. Face-to-face with products they may never have seen before, your customers may like to sample new drinks from your liquor supply. In a room darkened for mood, your bottles may fade into the background as the under-shelf lighting of the bar spotlights the bartender instead. However, display shelves lit from within by LED lights attract the eyes and shift the focus to your wares. With a sizable array of colors available to illuminate the bottles, you can produce dramatic exhibitions, washing the bottles in a gentle light show sure to captivate your drinking audience. 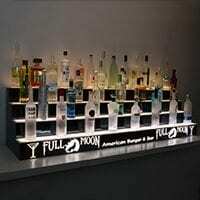 As no two bars are created equal, you may have a very particular lighted liquor display product in mind. By working with a custom designer, you can acquire the exact right set of shelves to boost your bar’s popularity. From single shelf to multi-tiered, from wrap-around square to wrap-around curved and just about any other configuration you can think of, you can build your lighted display to fit your space and needs to perfection. 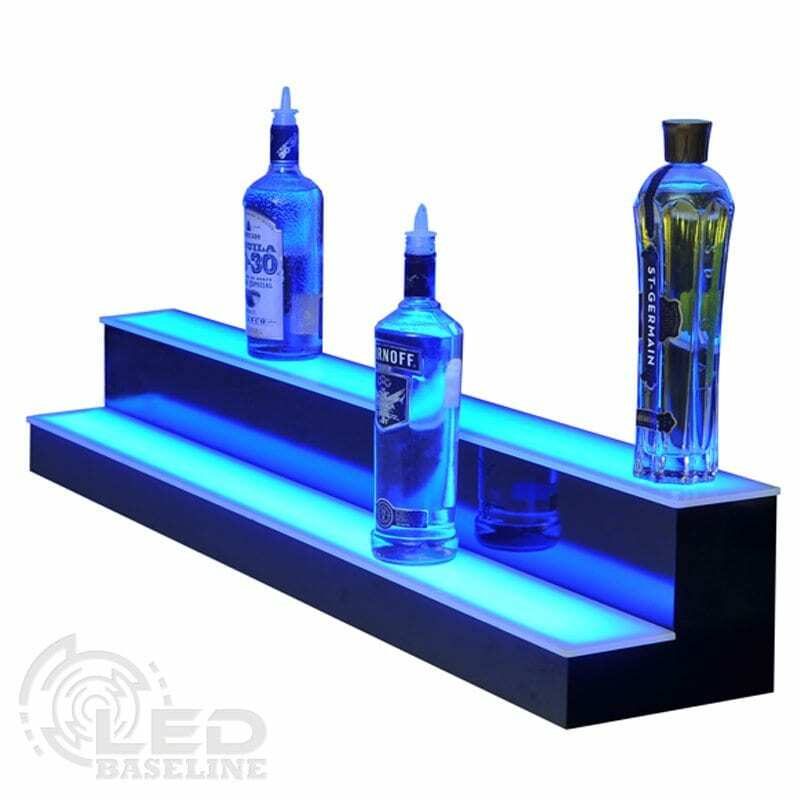 Also, because the LED lighting can generate a large range of colors and motions, your liquor displays can be as unique as your bar and the bottles they feature. Your liquor display, glowing from beneath with rotating color schemes, draws yet more attention to those artful containers. Inspired by the lovely bottles, intimately revealed on custom LED-lighted liquor shelves, your customers may well purchase more of their contents. A well-stocked bar will have plenty of liquors from which to choose. Setting them out for your patrons and guests to see not only generates interest, it saves space under the bar for the more mundane and less compelling items. Tools, rags, glasses, cutting boards, appliances and even the plane-jane plastic liquor jugs can all live happily out of sight. But your good spirits, especially those in decorative glass, should proudly line your topside mixing arena. 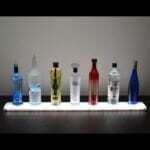 If you really want to show them off in a big way, you should invest in LED lighted liquor bottle displays. With tiered shelves propping your whiskeys and liqueurs, your assembled decanters seem a lot like a choir. When you light those bottles from below, they positively sing. 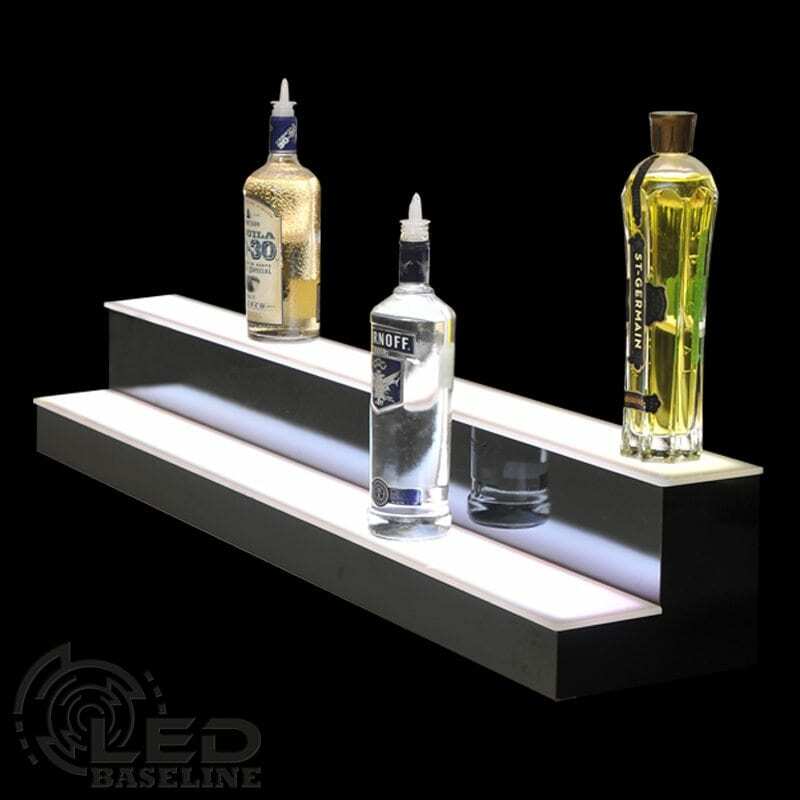 Uplighting from custom LED liquor shelves envelopes your wares in an elegant, even dramatic, glow. The transparency of the glass absorbs the gentle brilliance and highlights your spirits from within. With such a unique presentation, your patrons can’t help but stop and ogle your stock. Of course, the longer they linger, the more likely they are to place an extra order. When you add a dynamic light show to your bottle array, your guests will want to return with a larger crew of friends next time. You can fascinate them with a pattern of rotating light colors that you customize with your hand-held remote. With a multitude of color mixes and rotation patterns, you can keep your patrons guessing. Also, because these lighted liquor bottle displays fill your establishment with a higher level of refinement, don’t be surprised if your place becomes the date night destination of choice. 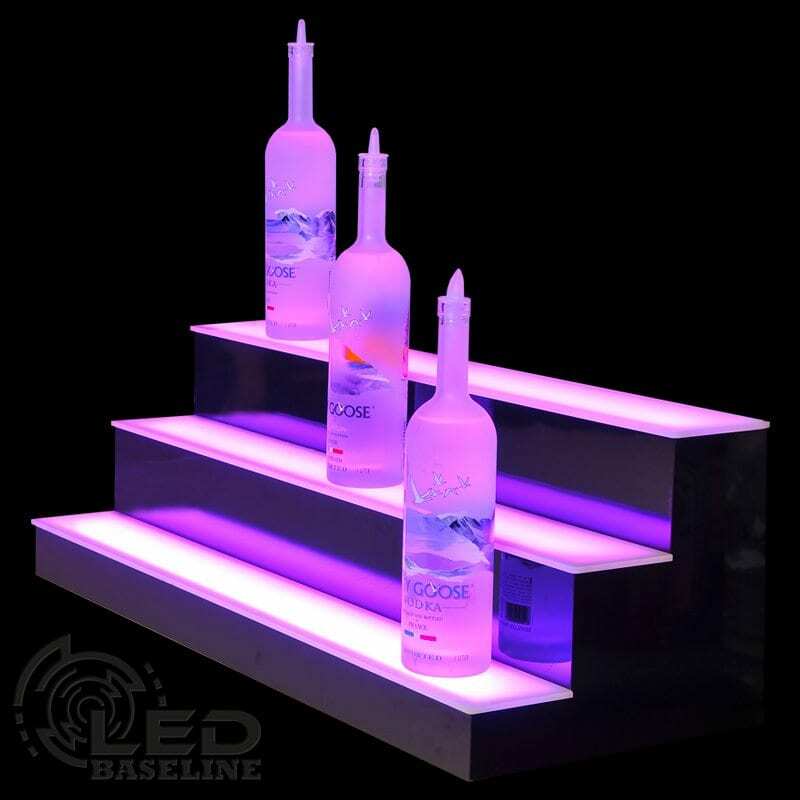 Custom LED lighted shelves combined with dynamic, multi-hued light shows ramp up the appeal of your enterprise. 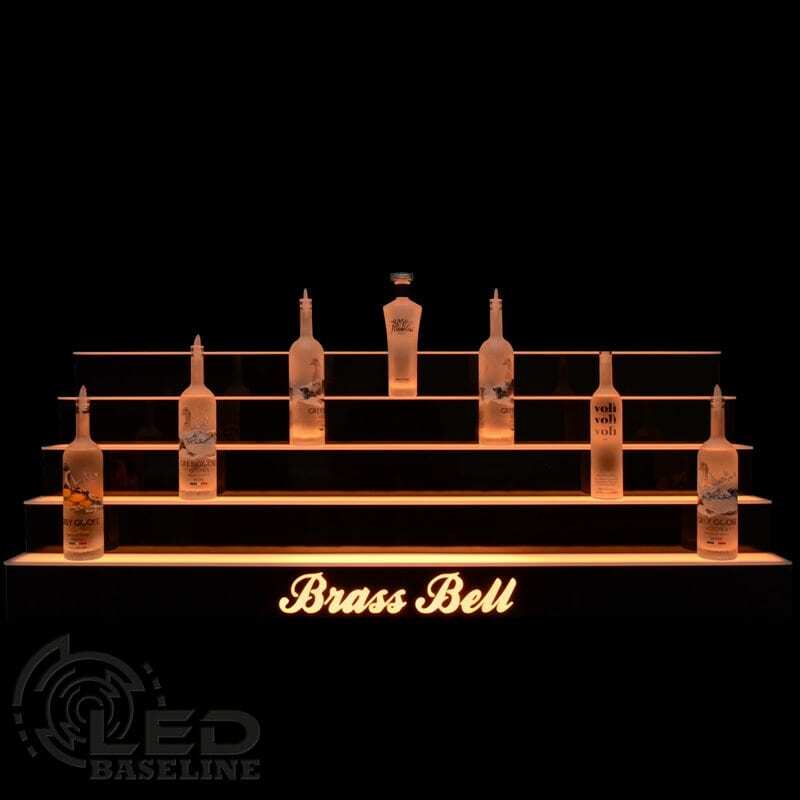 Turn your ordinary liquor bottle displays into captivating objects of attraction and sources of higher revenues. Do floating shelves actually drift around a room, making it difficult to dust the knickknacks? Maybe, if you give the physicists a few more years. In the meantime, when you attach a platform to a wall in such a way that the supporting hardware remains invisible, you create the illusion that the shelf floats in place. The design infuses a certain elegance to the room. But if you want to draw immediate attention to the ledge and whatever it holds, you add illumination. 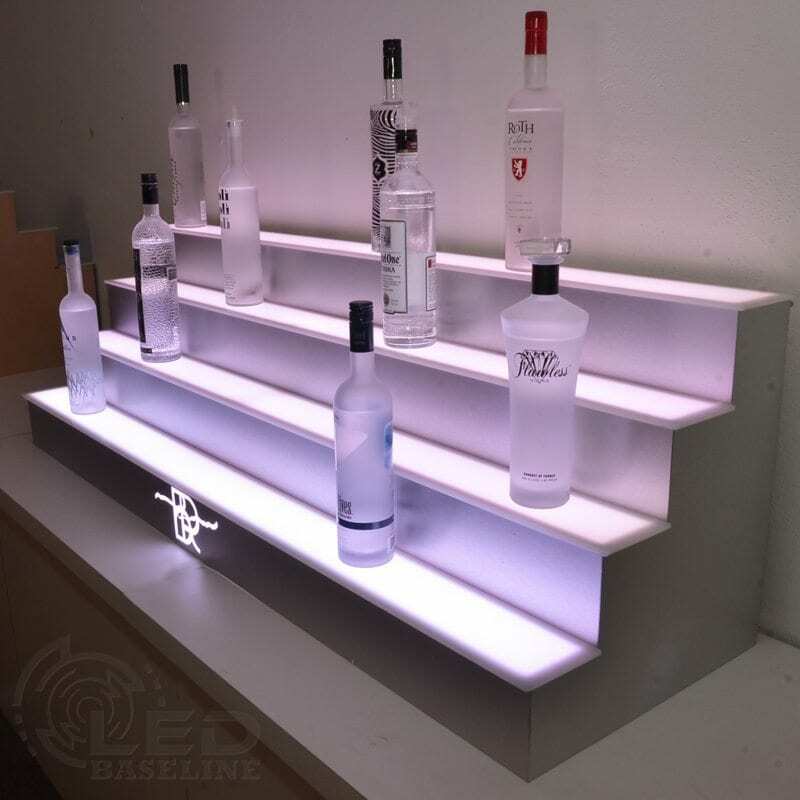 To absolutely fascinate the viewer, you hang floating LED lighted shelves. Restaurants, drinking establishments and art galleries garner many benefits from LED lighted shelves. Because they attract the eye and illuminate your offerings, they set the mood for buying. Nothing persuades like alcohol bottles and racked glasses displayed with rotating LED color schemes. The longer your guests gaze upon the arrangement, the more motivated they will be to sample your supply. Likewise, art resting upon the gentle radiance from below, takes on an irresistible, mystical quality. 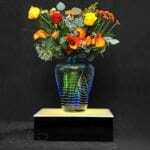 Sculptures, pottery, jewelry and other fine art become the focus, directing your prospective customers to the smaller wares you most want to sell. 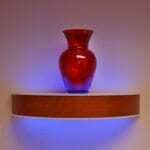 Homeowners appreciate the delights of floating LED lighted shelves, as well. In formal parlors, great rooms, man caves and home bars, these dynamic, color-washed shelves prove your superior decorating tastes to all your guests. Because LED lighting offers the most flexibility in fabrication and use, your lighted shelves can be made to change colors on a schedule you design. As they float peacefully against the walls, colors can fade in and out in tandem or independently per shelf, as you prefer. The charm of the shelves will also remove the chore from dusting your liquor bottles or sundry curios since you’ll enjoy the eye-pleasing show as you work. While floating shelves add a special class to any room, you, your customers and your guests will especially love floating LED lighted shelves.